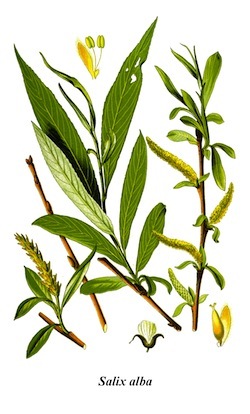 7,000 years ago, decoctions of willow leaves (Salix) were already being used to treat fever and pain. The natural active molecule present in willow leaves is salicylic acid. Salicylic acid is very effective when applied directly onto the area which is painful (cream, compress, etc. ), but far less when it is swallowed. This is because it is poorly absorbed by the gastric lining and rapidly eliminated. What is more, it is responsible for serious side effects on the stomach, namely gastric ulcers. Years of research have shown why. Salicylic acid inhibits proteins known as cyclooxygenases (COX, synonym: prostaglandin G/H synthases) and stops the synthesis of prostaglandins. Prostaglandins are involved in inflammation and the amplification of pain signals. There are two cyclooxygenases in man: COX1 and COX2. COX1 and COX2 are very similar but have biological functions that are slightly different. 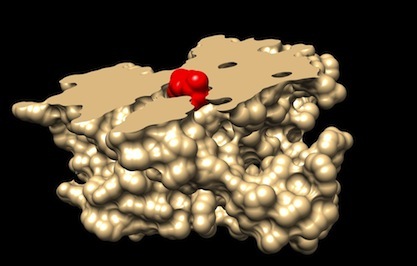 COX1 plays an important role in blood coagulation and in protecting the gastric lining. COX2 is produced locally in the event of inflammation, and is directly responsible for the sensation of pain. By inhibiting both COX1 and COX2, salicylic acid does indeed have the desired painkiller, anti-inflammatory and anti-fever effects, but also causes undesirable side effects on the stomach and coagulation. Plants have always been an excellent source of inspiration in pharmaceutical research, but natural products are not always suitable for therapeutic use. Which is why they are frequently copied and slightly modified to produce drugs that are not only more effective but also as safe as possible. This is what happened with salicylic acid. Towards the end of the 19th century, researchers modified the molecule by adding a small chemical group called acetyl. Acetylsalicylic acid, more commonly known as aspirin, saw the light of day. Our bodies absorb acetylsalicylic acid much better absorbed than its parent; it can be taken orally and is a very effective painkiller, anti-inflammatory and anti-fever agent. It has been hugely successful and, today, aspirin is the most popular drug taken worldwide! There is one problem though: aspirin has the same undesirable effects on the digestive tract than its mother molecule, salicylic acid. What is more, it also interacts with many other different proteins. Years of hard work revealed another class of drugs: non-steroidal anti-inflammatory drugs (NSAIDs). 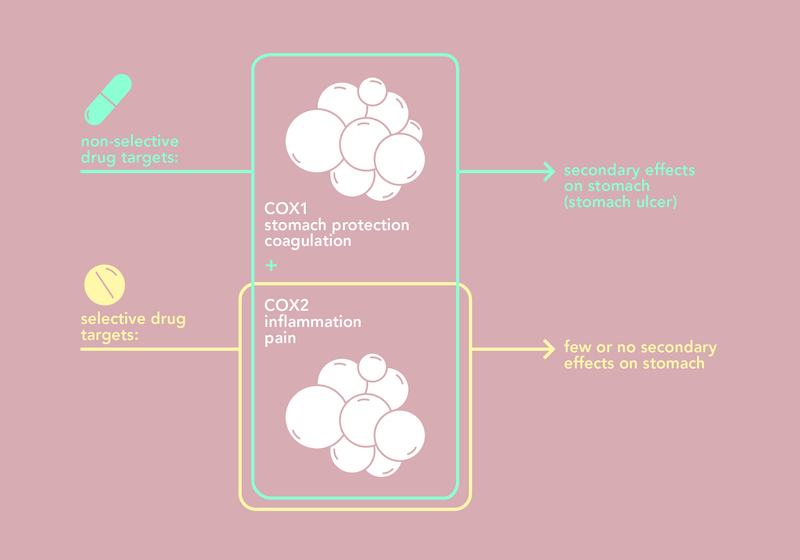 The first NSAIDs molecules inhibited both COX1 and COX2, just like aspirin does – which is why they are also called “non-selective inhibitors”. At the turn of the century, other molecules that specifically inhibit COX2 were designed; these molecules belong to the "coxibs" family (selective inhibitors of COX-2). These molecules have the desired anti-inflammatory effects without the gastrointestinal side effects. to estimate the fate of a small molecule in the human body (swissADME: Absorption, Distribution, Metabolism et Excretion). Ibuprofen (Brufen®) inhibits COX1 and COX2. Ibuprofen is an NSAID which is frequently prescribed for short-term treatments against fever or pain, such as headaches, flu symptoms, toothache, muscle aches and painful menstruation. It was discovered in the 1970s; the patent is expired and the molecule is now in the public domain. Computer model of ibuprofen (in red) bound to COX1 (cross-section, in beige) (PDB 1EQG). Flurbiprofen inhibits COX1 and COX2. Close to ibuprofen, this molecule is sometimes used for treating arthritis, and is effective against sore throats. Diclofenac (Voltaren®) targets COX1 and COX2. It is also prescribed for numerous inflammatory pains, in particular joint pains such as in arthrosis or sciatica. It is used in the composition of creams and plasters used for sprains. Diclofenac is also prescribed in pediatrics because it is very effective against ear infections for example. It was discovered in the 1970s and is now in the public domain. Nimesulide was synthesized in the 1980s. This molecule inhibits COX2 more than it does COX1, and has therefore few undesirable gastric side effects. However, nimesulide can be toxic to the liver. This is why, though very effective, the drug is only used in very serious cases of polyarthritis and under strict medical supervision. Salicylic acid is a natural molecule which inhibits COX1 and COX2, and is described above. Celecoxib is a selective inhibitor of COX2 and belongs to the « coxibs » family (see above), which was put on the market in 2000. It is used to treat rheumatic diseases (arthrosis and rheumatoid polyarthritis). It does not inhibit COX1 and has no side effects on the stomach. As a precaution, celecoxib is not a first-choice treatment because other coxibs family molecules seem to be toxic for the heart.